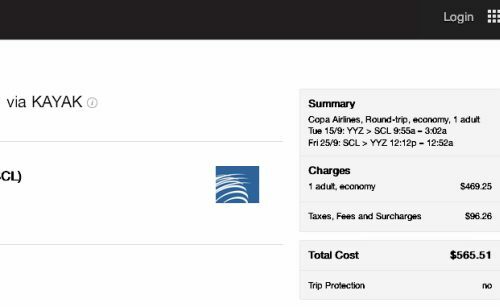 The mad prices on COPA from Toronto to Central America & South America continue to pop up every now and again. This time, it's involving flights for travel between August 2015 and October 2015. There are flights from Toronto to Santiago, Chile (SCL) for just $588 CAD roundtrip including taxes. 2. Click on the departure date box, to bring up the calendar view. 3. Select some dates between August and October that are showing as $588 roundtrip. 4. 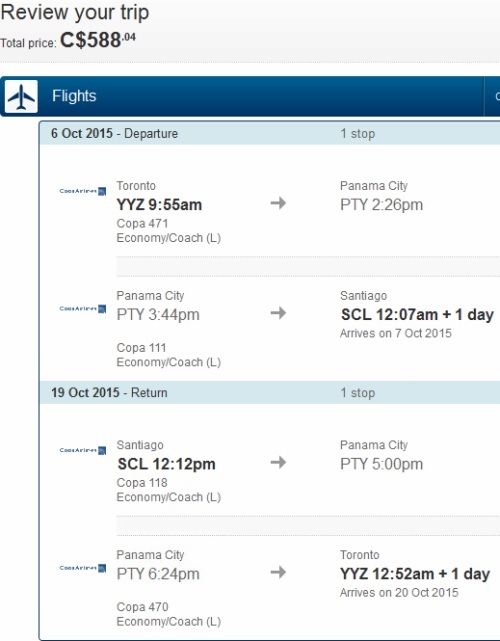 Click through from Google Flights to the COPA website to book. Google Flights is also showing Flight Network as having this price, but clicking through to Flight Network, the price seems to rise drastically. NOTE: Google Flights may send you to the U.S. version of the COPA website. You can take the same dates, and search manually on the Canadian version of the COPA website, to book in Canadian dollars. The price seems to now be jumping substantially when going from Google Flights to the COPA website. But they're showing up on Kayak, and some of them seem to still be bookable when you click through from Kayak to FlightHub or Expedia. 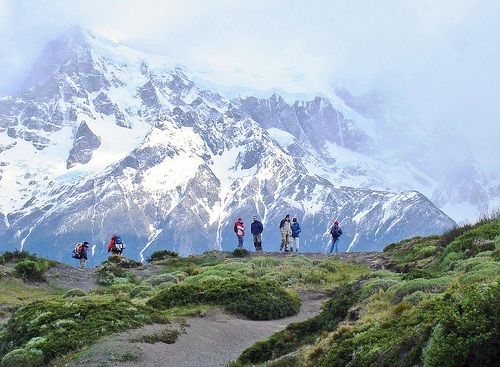 - Certain dates in September and October are now showing up as $566 CAD roundtrip including taxes for Toronto to Santiago, Chile (SCL). toronto, yyz, flight deals, costa rica, central america, panama city, panama, pty, san jose, sjo, south america, santiago, chile, scl, ecuador, colombia, copa, medellin, mde, montevideo, uruguay, quito, uio, santa cruz de la sierra, bolivia and vvi. 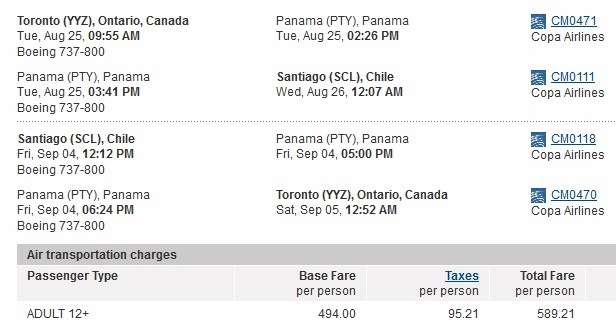 2 Responses to "Toronto to Santiago, Chile - $588 roundtrip including taxes | August 2015 to October 2015"
This is the 3rd flight I have booked to Costa Rica from your email notifications! Stephanie, where do you visit in CR? Do you use AirBNB? I am looking for some suggestions, thank you!